The promo-CD I’m holding in my hands contains 7 tracks of... should we call it old school black metal. 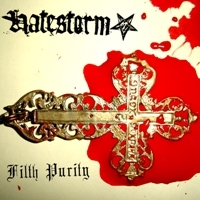 HATESTORM shifts between mid-tempo and up-tempo metal sadly with no real impact. Even after numerous spins in my player, I still feel disappointed. Except for a few riffs and rhythms ‘Filth Purity is not above average in my humble opinion. It’s hard to believe that this band has played together for about 8 years, because this album actually sounds more like another demo release than a final product. Another thing I just have to complain about is the production. It’s muddy and without power. It’s actually quite bad. wait for the band’s next album.